Day #17 of AEDM and NaBloPoMo – their writing prompt for today: What is the hardest lesson you’ve learned from having pets? I think one lesson I learned from NaBloPoMo is that I don’t like to write with prompts too much. Well, at least not spontaneously and in the morning. So, for now I will keep listing the daily prompts, but more likely than not I will not be following them. Which is o.k., because they are supposed to be an inspiration only. Therefore today I will be continuing with my little photo series of the Pacific Northwest of the US, specifically Washington State. As during all our trips there we stayed right at the beach as you can see from the couple of pictures below. We dubbed that particular beach ‘Moon Beach’, it really looked weird. But last time we decided to take a trip up the mountains to get closer to Mt. Baker. As it happens often when we take road trips, we tend to stop at a lot of places. And trust me, driving up the winding road and through the rainforest there are a lot of interesting spots. And the amazing thing, yes, there are tourists (like us), but not too many and none of the places were crowded. Then we took a turn off the main road, deeper into the woods and the silence gets interrupted by a loud, continuously increasing rumble. 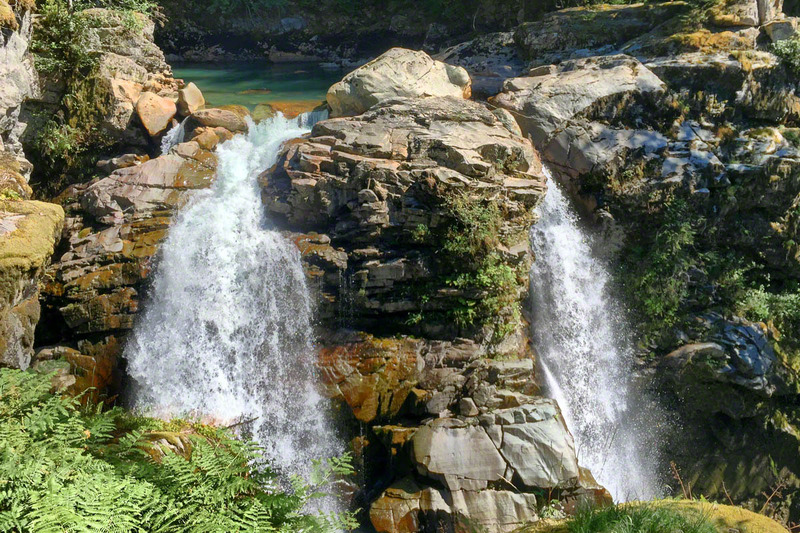 The Nooksack Waterfalls. David has a thing for waterfalls and I got to admit they are quite something. Begin the height of summer when we visited, we didn’t expect them to carry too much water. But, boy, were we wrong! I hope you will enjoy the waterfall photos, gallery below, of the Pacific Northwest. I posted a couple of videos incl. slow mo in this post here. Exquisite. I would love to spend time at these places. I love all the waterfalls out there!! You know I love hearing about your (and David) adventures!!! This is great – getting to go on the journey with you. It’s a gorgeous waterfall, and I love that it splits into two around that rock outcrop. Makes it so dramatic. I need to practice catching moving water like this. Mine comes out rather flat and boring, but here I can feel the energy of the falls. The falls are amazing. We were there in the summer – it’s such a beautiful place.